Period: Cube is a visual novel for people who don’t have quite enough time or patience for a mammoth title with all the trimmings. 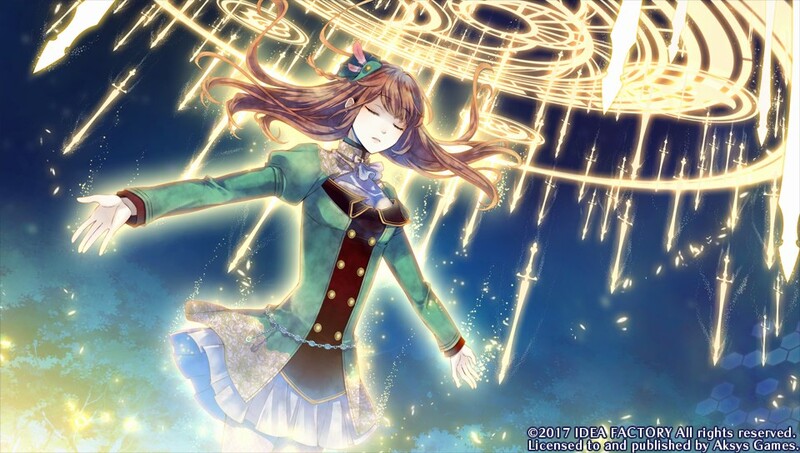 It certainly feels a little shorter in total, and individual story arc, length than other Otomate titles, such as Amnesia: Memories or the juggernaut Code: Realize - Guardian of Rebirth. This doesn’t mean, however, that the developer skimped on the number of routes — and therefore eligible male partners — for there are seven in total; a very respectable smorgasbord. It’s rather in the streamlining of the story architecture and the management mechanics of a text-based, choices-driven game that we see a de-cluttering of the gameplay process which I, for one, find very welcome. More on that in a moment. 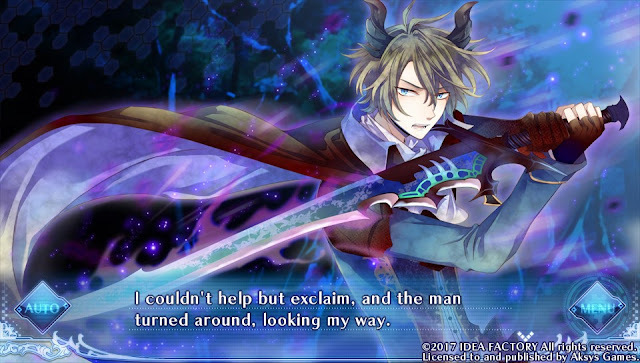 Related reading: Another visual novel from the same team, and also available on Vita (and PC) is Amnesia. 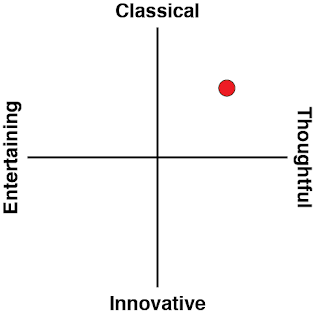 Harvard's review. First, let me give you a very barebones background of the story itself. Our female protagonist, Kazuha, is the archetypal sweet, well-intentioned girl; she has a strong sense of what’s morally right, and this is not just a pleasing personality adjunct but central to a story that revolves, literally over life and death, all around moral choices. Her much-loved, but recently distant brother has disappeared, and she sets out, together with equally worried childhood friend Hiroya, to find him and avoid distress to their parents. And that’s it — I’m not giving much more away, because after a brief common prologue, you’re thrown into the individual character story routes, and the painstaking, incremental details and revelations, as you progress, are vitally important to full enjoyment. Period: Cube is, deep down, a tale that probes issues of all-devouring love, guilt, unattainable desires, possessiveness; of eating of the fruit of knowledge and the consequences; and about our memories and what happens if we lose them. Is a life without regret possible or desirable? The game weaves these themes in and out of the story skilfully without them ever taking over what has to remain first and foremost a gripping account of young people trapped inside a virtual world. We have had this type of story setting before, in games and anime, in the West most famously with Sword Art Online; but of course the classic .hack multimedia franchise is the true forerunner here - the first one to trap players inside an MMORPG while their real-world bodies fall into a coma. The first thing to hit your eyes as you start up Period: Cube is a sumptuous colour palette, dominated by cerulean blue and turquoise, complemented by deep purple tones. 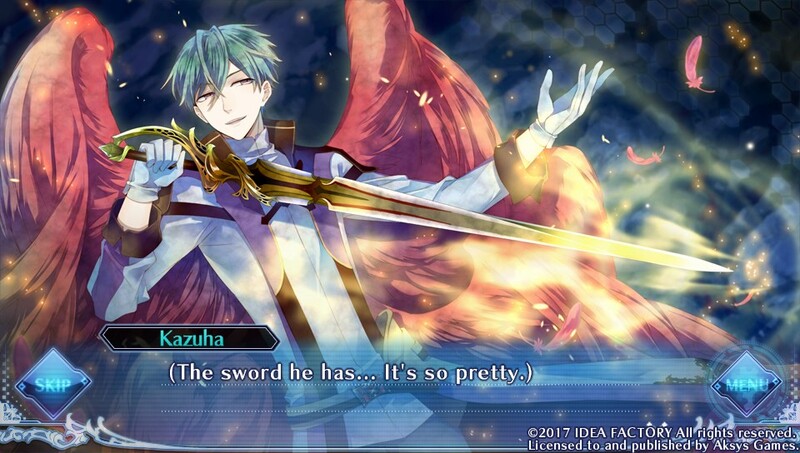 The Vita screen literally lights up with this riot of intoxicating watercolour effects. Then, during the opening theme sequence, you can very briefly see hexahedron shapes floating in the background; the very same six-sided cube shape that featured so prominently in all .hack game openings, as the symbolic shape of the “dot”. This shape we now see reincarnated in the Period Cube itself — a mysterious, floating cube in the final dungeon called “the Ark” — and I can’t see this as anything but a studied and reverential reference to the very game that inspired a cult following. “Light and darkness. Yin and yang. The angels of Heaven and the demons of Hell.” With these portentous words the story begins. The virtual world of Arcadia — deemed by the game developers to be “the final paradise” — is divided into two player factions: angels and demons. Kazuha soon discovers that for the trapped players their affiliation could mean death or survival; for the faction that first manages to clear the Ark and to claim “God’s Heritage” will be able to return unharmed to the real world, whereas the other faction will perish in Arcadia. Death in Arcadia means death to your body lying in an “idiopathic coma” in hospital. The Latin phrase “Et in Arcadia ego” plays a crucial role at one point, and this is no flimsy wordplay, for it translates as “"Even in Arcadia, there am I", with the “I” usually interpreted to refer to death, and Arcadia of course to a utopian world, depicted by 17th-century painters as a bucolic paradise. The game’s Arcadian scenery is certainly rendered beautifully. But what about the characters — the most important feature of an otome visual novel? Happily, I can assure you that they couldn’t have picked a better artist than Kuroyuki (best known for Black Wolves Saga, which still awaits an official English localisation ...). Her stylised character design is simply gorgeous and subtle and shines especially in the many CG stills unlocked during gameplay. I would go as far as to say that the art of Period: Cube is the special highlight of my experience with the game. It certainly helps make the choice of picking your amorous interest in each route that much more engaging. And what a choice of smitten and enamoured suitors you have! 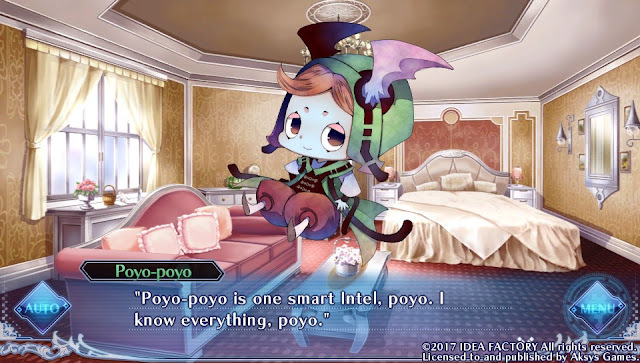 There’s the mischievous, cross-dressing opportunist; the forceful, glowering, often rude guy with the looks of a ravishing pop idol; the loyal childhood friend; the adoring, old-fashioned gentleman type; a demoniacal, psychotic killer; a cute and funny mascot character; and one who is actually a truly virtual NPC character. What really brought the budding relationships to life was the yin-yang of personalities as seen in Arcadia and as they were, often so very different, in the real world. Yes, there is a way to escape the virtual prison, but only for a short period, if a special quest is completed. This grants just enough time for two important narrative devices: to investigate the circumstances of your brother’s disappearance and the power of the Period cube, and to pursue your relationships with the real-world lovers rather than their virtual counterparts, who are role players of their desires and escape fantasies. The virtual MMO world of Arcadia (on a secret, hidden server) has been created with astonishing detail. If you have no experience whatsoever of what it might be like playing in a massively multiplayer RPG online, then Period: Cube would provide a really solid introduction. And that’s the biggest problem, right there. Much time and effort is spent ploughing through basic explanations of MMO mechanics. Even if you click with nimble fingers through those text passages, you’ll nevertheless still be exposed to the ‘live’ multiplayer battles, complete with demonstration and exposition on suitable moves and tactics. That’s right — this is a visual novel that integrates battles into the story, something that has been done before, of course, most notably in Xblaze Code: Embryo, http://www.digitallydownloaded.net/2014/07/review-xblaze-code-embryo-sony.html which featured probably the best animated fighting sequences in a visual novel to date. Those in Period: Cube are merely adequate by comparison and failed to get my heart rate to rise. Most of the monster designs are not terribly impressive or frightening, and animations (that bear’s paw swipe is sadly unconvincing) sometimes veer into the unintended comical. I can see how in a teeming visual novel market like Japan, where many players may well not be involved with games of the RPG genre, this extended simulation of life as a MMORPG player makes sense and adds flavour. But here in the West, this approach strikes me as misguided. Visual novels are still a niche indulgence, and their players tend to be those already heavily into JRPGs in particular. This is an issue that should be considered at localisation level, I feel. As it is, the nature and length of these ‘tutorial’ scenarios cause a dispiriting slowdown and ultimately sense of irritation. Stir into this MMO primer pot a healthy helping of often vacuous chatter during these scenes, and the impression of ‘social filler’ is inescapable. I realise that many visual novellers want and enjoy the banter between all the different characters — heck, this is a time-honoured tradition in VNs! — but for me it shouldn’t artificially lengthen the story arc, nor take away time that could be better spent on deepening crucial relationships or ensuring plot lines are traced with clarity. I don’t believe there are any significant plot holes in Period: Cube, not if you don’t rush through dialogue; but due to the relative brevity of individual routes and the complex intertwining of events and revelations, this impression may easily arise if you speed through the story. 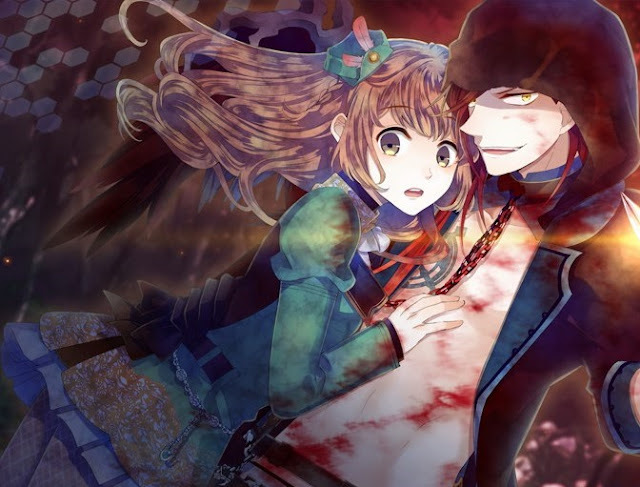 As I mentioned at the start of my review, Period: Cube showcases some streamlined mechanics that add valuable features to unravelling the story, its seven good endings and associated alternate “merry bad endings”. However, one feature I could jolly well have done without is the constant repetition of important facts, reminders of conversations past, or memories unlocked. I felt like I was targeted as a careless reader. What — me? Take that back, sir! Again, this may come down to the difference in readership between Japan and the West, and thus to localisation sensitivity. It is never a sound approach to treat the reader/player as lacking in memory span. After all, the game provides an accessible ‘Backlog’, with text you may have missed easily retrievable. Another helpful feature is the ‘History’ section, which provides an excellent diagram overview of all the routes, their branchings and intersections, in an easy-to-read format. The mechanic I found the most helpful of all is the instant affection level feedback you receive after making a dialogue choice. This obviates the need for fiddly multiple save files and toing and froing to figure out how to get the correct answer to progress your current route towards the desired ending. In conjunction with the Quick Save/Load option, this cuts out a lot of faffing around and gnashing of teeth. I’m simply not the martyr type, and anything to keep the story rolling along is a plus in my eyes; you do have the choice, though, to toggle off this feedback. There was a nice amount of humour sprinkled throughout the story, without it turning into an overly loud relative you can’t get rid of. I wasn’t sure, however, in some of the more ambiguous scenes, whether an ironic subtext was meant to be present but failed to ignite, likely because of the rather workmanlike translation. In contrast, what can only be described as inspired are both the music and the voice acting. Some of the actors you may recognise, as they appeared in other localised VNs such as Code: Realize, Hakuoki and Danganronpa. The soundtrack consists mainly of sweeping piano and strings composition, and the opening theme, sung by Joelle, is a true hummer. The theme of “light and darkness” infuses everything in Period: Cube, from the obvious religious references and symbolism to the story arc resolutions. The alternate endings, in particular, are well worth winkling out, as they show us the potential darkness of following a path that unquestioningly appropriates the digital nirvana opened up by the cube’s power. There is one main route that impressed me in particular, and I fear it’s a choice that may initially seem the most uninteresting. 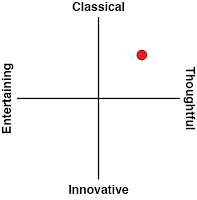 This route explores, with intellectual curiosity and honesty, the emotional see-saw a purely artificial-intelligence character undergoes as he develops and transmutes into .. a different kind of being. While not the most convincing romantic partner for Kazuha, I found the premise of his existence so intriguing that I got swept up in the story more than some of the others. I was especially struck by one scene which portrays what is clearly a ‘merging’ of two lovers, metamorphosed by the digital nature of their encounter. It is a brave scene, exploring sexuality through virtual reality, and bypassing any sense of smuttiness with ease and elegance. Eventually, you will arrive at the final ‘true ending’ route, after first completing one other designated route, and here I had a mixed experience; both appreciating how all the strands came together, but at the same time regretting that the narrative used another well-worn otome trope for its romantic conclusion. Related reading: Another must-own visual novel on PlayStation Vita is Hakuoki. Matt's review of that game. Period: Cube adopted the much-travelled path of the “trapped in an MMORPG” trope. It had the potential to fashion its own, distinct world and story type but decided to remain faithful to the original trope, to a fault. Not surprisingly, for anyone with knowledge of the Sword Art Online series, or Log Horizon, or even .hack, this road runs the danger of engendering a sense of déjà vu. Outstanding production values, smooth technical features and entertaining romantic entanglements go a long way towards making this Otomate title a pleasure to play; but the lack of overriding originality, and falling back on some of the stock filler props of the VN genre, hold it back from being a truly innovative iteration in the crowded field of stories of players imprisoned in a virtual world. Not every game needs to be innovative, however, to provide thoughtful entertainment, and Period: Cube most certainly provided me with that in good measure.